As you may already know by now, OS X Yosemite is out, and is a free upgrade. So if you’re coming from previous version of OS X, you can download OS X Yosemite from the Mac App Store free of charge to upgrade your machine. 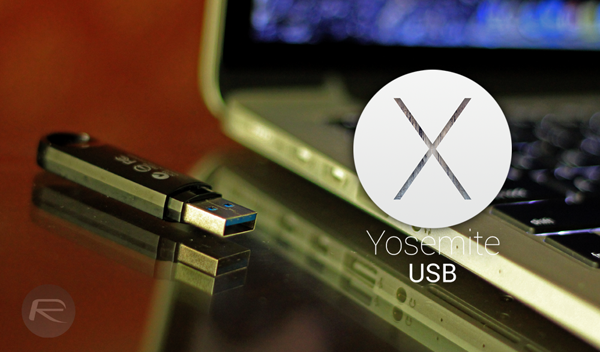 However, if you wish for a complete clean install of OS X’s latest on your Mac, the best way to go about this is to create a bootable USB drive of Yosemite. In this guide we will show you how to do just that. 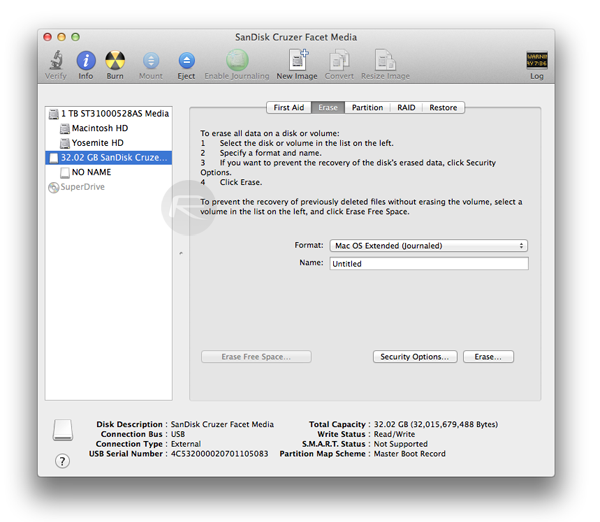 The older method used to make bootable drives of OS X Lion and Mountain Lion installer did not work for OS X Mavericks. Same is the case with OS X Yosemite, which follows similar installation pattern to OS X Mavericks. 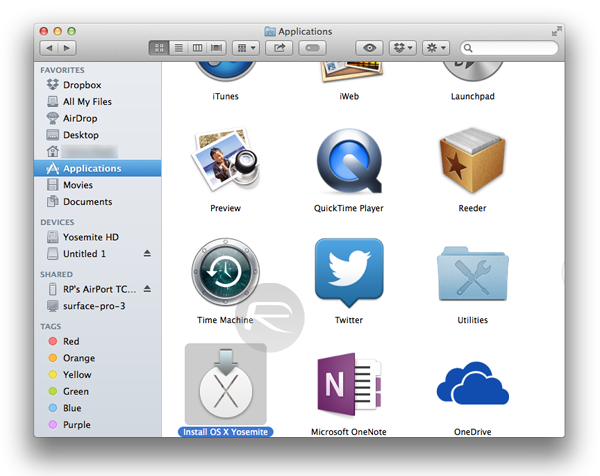 A Mac with ‘Install OS X Yosemite.app’ file downloaded from Mac App Store. A USB flash drive with at least 8GB storage capacity. Step 1: First up, you will need to format the USB drive. To do this, start ‘Disk Utility’, select the flash drive from the left sidebar, select ‘Erase’ tab from right, and make sure the name is set to ‘Untitled’, format is set as ‘Mac OS Extended (Journaled)’. Now, click on ‘Erase…’ button, as shown in the screenshot below. Step 2: Next, select ‘Partition’ tab. Select ‘1 Partition’ from ‘Partition Layout’ dropdown menu. 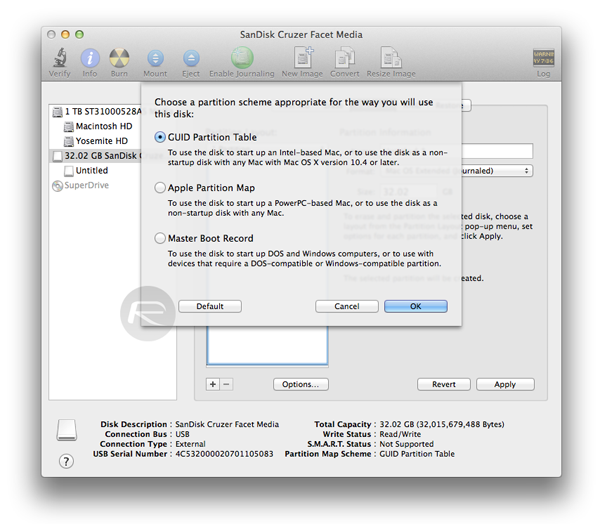 Click on ‘Options’ and make sure ‘GUID Partition Table’ is selected as partition scheme. Also make sure the name is set to ‘Untitled’, not ‘Untitled 1’ or anything else. Once done, click on Apply to create this partition. 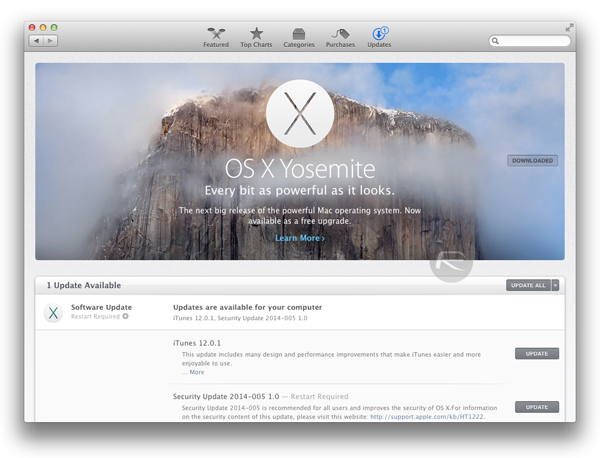 Step 3: Download OS X 10.10 Yosemite from Mac App Store. Once downloaded, quit the installer and make sure that the OS X Yosemite installer that you downloaded from the Mac App Store, is in Applications folder, and set to its default name; ‘Install OS X Yosemite.app’. Terminal will now prompt you to enter your OS X password, so type it in, and hit Enter again to begin the process. That’s it! 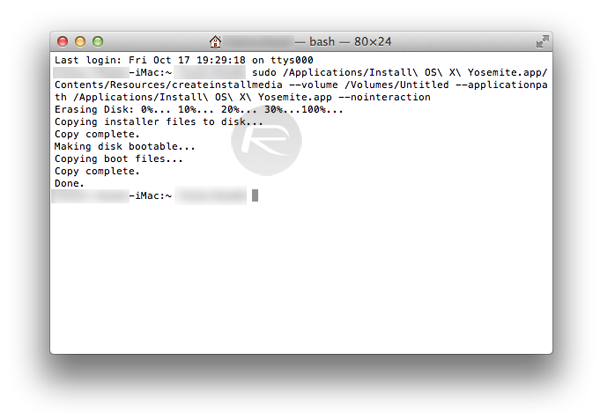 Your Yosemite bootable flash drive is ready for clean installation. 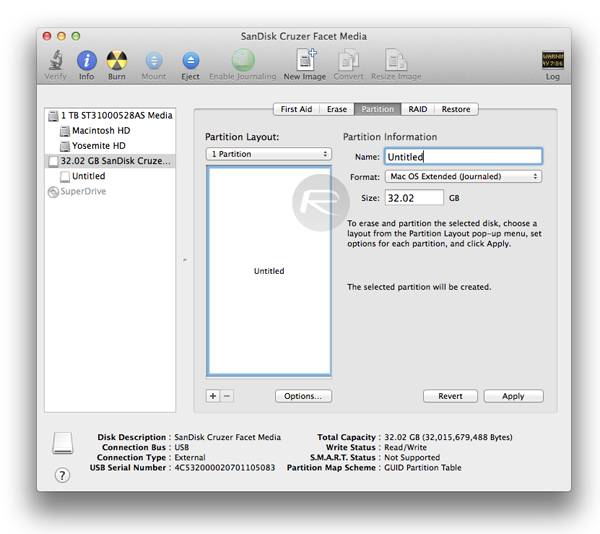 “createinstallmedia: invalid option — ? That did the trick for me. thank you! Does that mean I do not need to burn it on DVDR ? Bootable usb flash drive will do just fine ? Right ? Sorry about my English. I get that as well, did you manage to fix it? Oh and I am installing from Yosemite. the reason is I am selling my Mac Book and need to do a clean install so none of my data can be accessed. I figured out the password issue, however the command is not recognized, I checked over and over to eliminate any mistakes. however one issue i find is when ever I try to rename the OS X Yosemite install to add the .app it reverts back so .app isn’t there. I am wondering if that is why I am getting the error? Which — should I replace with dashes ? Please ? I ejected the disk and put it back in. Seems to be working. This is likely because you haven’t installed the Yosemite OS X update application from the Mac App Store. Very nice, clear and precise guide! Thank you! This is caused from some other process using the drive. Close any apps using it and try again. Can that created bootable drive install on different model macs and have the correct build number? Thank you it very accurate!! i have the same password problem. can you please help me out. Hi! I was wondering if you can create this bootable usb on chrome os. My macbook will not boot, so I was going to install a new ssd and install the new os from a bootable usb I think I can make on my chromebook. Is this possible? This worked for me! Just wish I read it before I wiped and tried 8 different flash drives. I fixed it by going to ActivityMonitor and terminating itunes helper and other disk management utilities. Thanks ListenUp.